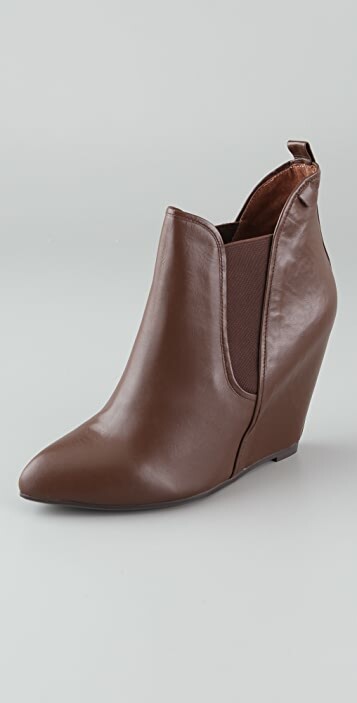 These leather wedge booties feature a pointed toe and elastic gore side insets. Pull tab at asymmetrical top line. 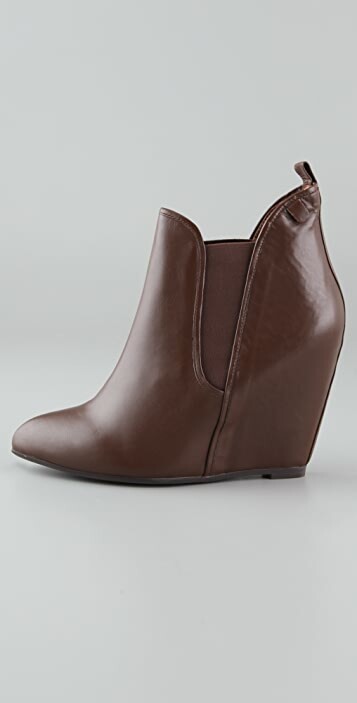 Hidden wedge heel. Rubber sole. Happy with my purchase. I have other Jeffrey Campbell boots and this is my second season wearing them and I've had no issues with quality. I do know that they run a bit large though..about 1/2 a size. I've ordered these in my true size 9 , I wanted them a bit large to wear thick socks with and they're perfect. Very comfortable, can walk around for hours no problem. A good everyday running around boot at an affordable price. I liked them so much I ordered the brown ones too when they went on sale. Both look great with the missoni thigh high socks. These shoes are true to size... i misread the comments about them being larger than expected and ordered half a size smaller than my usual and they are a tad too small.. but very cute! i havent noticed any sagging of the leather... and they have a really nice profile, not easy to get it right with wedgies. think someone else also recommended to buy em, you wont regret it..! So nice, so comfortable! Great for long walking. I had my eyes on these boots forever. I made the move when they finally went on sale for 50% off and couldnt be happier with them! They are comfy, cute and stylish. The wedge heels gives a nice lift to your legs and bum. I may get the black ones as well. Defiinitely a great buy for the fall and winter months to come! This is what wedges supposed to do - they feel like flats but make ur legs look so long. I got my in black and they go with pretty much everything. They look so chic with skinny jeans tucked in. I saw this style in shiny leopard (on other sites) and now i really wanna get them too. U won't regret getting them. the opening of the boot is too large for me, but partly because I have a skinny ankle. I also feel that this boot feels a bit flimsy and not as sturdy as it looks. I like these wedges especially now they're on sale. They are a bit large in size and do suggest sizing down half a size. I agree with the first reviewer in that they slouch a bit. 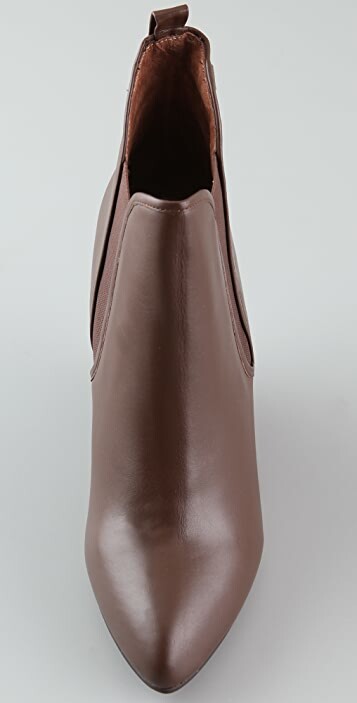 I am between a size 7.5 and 8 and got an 8 (should have chosen a 7.5) Need insoles and even with the insoles they slouch but have decided to keep them as they're very comfortable. They go with almost anything! I love JC shoes! These were almost the perfect little booties. I bought the brown color. Size: I'm usually either 6.5 or 7, but in these booties I got a 6.5 and they fit perfectly. Reason for return: The soles were coming apart in the left bootie. The glue or whatever it is they use was coming unattached! So sad I had to return them because they go with everything. Wish the quality was better. These I was in two minds about when I bought but I have found them to be really handy as they go with everything and are very comfortable. 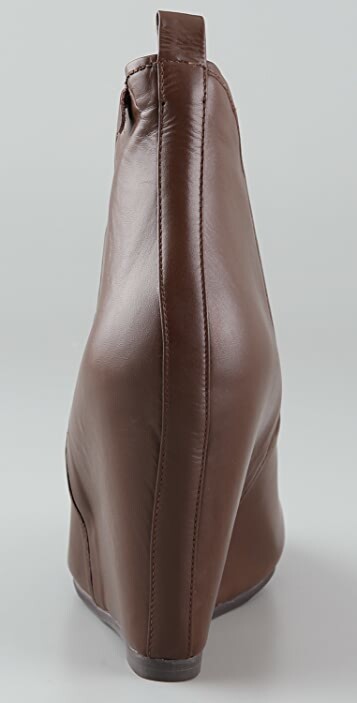 My only criticism would be that I have quite a slim foot and I found the leather slouches a little bit on the sides.